Research, documentaries, NGOs , international comparisons and basic statistics are consistently showing we have a huge crisis in New Zealand, our levels of child well-being rank us closer to third world nations than developed ones. Our current record for looking after and protecting our children is abysmal for a supposedly asset rich nation with a small population. 25% of our children do not have their basic material needs met because the homes they live in do not have a sufficient income to do so. 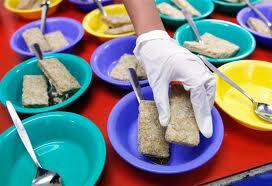 This means we have large numbers of children who lack proper nutrition and live in substandard housing. With the median income in this country being only $27,000, and many earning far less, many families are dependent on the state and community groups for support. The National Government is always reluctant to invest in anything relating to environmental and social issues but is prepared to spend millions on World Cup Rugby, and billions bailing out investment companies and building motorways of doubtful significance. They go through the motions of supporting our vulnerable children by producing a green paper that was effective in delaying action and ensuring they had the research written by those who would be more likely to provide the "right" outcomes. As with most National Governments the responsibility of dealing with social and environmental issues are shifted substantially away from themselves. Spending in these areas is seen as a cost, not as an investment. Demanding that mothers of young children find work while not providing well paying jobs to go to (65% of mothers with children under 12 months work). Increasing demands for childcare while cutting funding and the quality of teaching in early childhood education. Forcing young, poorly qualified parents into low waged employment while cutting training and study opportunities and keeping the minimum wage low. Demanding better teaching but sacking advisors and increasing class sizes. Wanting higher standards of support for vulnerable children but refusing reasonable pay and conditions for teacher aids. Children coming to school suffering from poor nutrition and then removing the requirement that schools provide healthy food. Requiring the identification of vulnerable children but not providing the funding or resources to properly support the families involved. "There may not be a need for more money to be spent on vulnerable children, but rather a willingness to make better use of the resourcing we already have." A little like cutting funding to Ministries and state departments "to improve frontline services" and therefore having higher expectations and over working those who remain. "Other countries are adopting a more rigorous approach to identifying which are the best programmes and services to invest in. In the United States, the Washington State Institute for Public Policy was established as an independent source of advice on evidence-based, cost-effective programmes and policies. The Washington State Government has adopted many of its recommendations." For some bizarre reason this government looks to the United States for models in social and educational policy yet the US has its own own crisis with child poverty. Why not look to countries that have the best outcomes for child well-being, like Iceland, Sweden and Denmark rather than one of the worst? "New Zealand has a tradition of innovative programmes and services being started by iwi, individuals or small groups. There needs to be a process to evaluate good ideas and consider whether those ideas are suitable for investment." New Zealand has many existing programmes and initiatives that have proven to produce good results yet the government refuses to properly fund and resource them and wastes millions on flawed ideological initiatives like National Standards. The process to evaluate good ideas to deem them suitable for investment does not currently involve respected professionals but Ministers with limited understanding. Providing fewer services to children at lower risk of poor outcomes." The government has a long record of cherry picking research and evidence, for instance they support academic, John Hattie, when he says that class sizes aren't the most significant factor in educational outcomes but ignore his concerns regarding National Standards. All initiatives appear to be fiscally driven rather than child outcome driven and because this government bases spending on short term goals any initiative that will have long term significance will not get the support it deserves. Rather than apply new funding to areas of need, the Government intends to take funding from other areas. Often when assessing need, arbitrary levels of ability are used that do not take account of the whole situation. I heard of a phone assessment of a ninety year old lady where they asked her questions about her mobility and because she was physically capable they removed her support. However, the women was blind and no question was asked about her vision. As a teacher I have had support taken from children who only function well because they have received support and when it is removed their learning deteriorates and they immediately become part of a higher need group again. Of course all of this ignores the major causes of the whole crisis, low family incomes, poor housing, limited job opportunities and growing income inequities. Until these are addressed all we will be doing is dealing badly with the symptoms, not the causes, meanwhile the crisis grows and so do the future costs to our country. Alan Johnson, author of "The Growing Divide", is interview here and clearly lays the responsibility for action in the Government's lap.